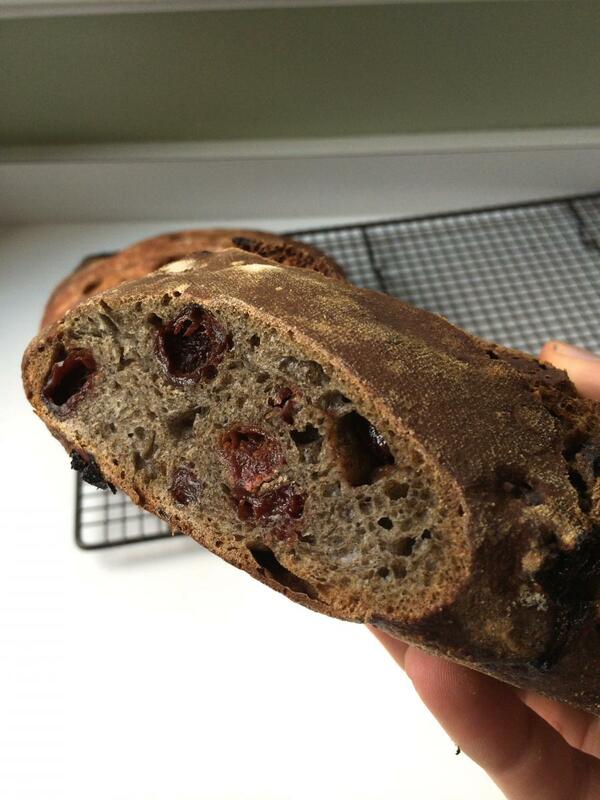 Inspired by one of the many killer loaves I had eaten at High Street on Market in Philadelphia, I decided to try and recreate their buckwheat cherry bread. They haven't shared their recipe, so I played around with a basic sourdough cherry bread recipe and subbed in 20% buckwheat flour. This version ended up with a moist crumb, a chewy crust, and a great flavor balance from the nutty buckwheat and the tart cherries. Just as good as High Street's, if you ask me. It's delicious toasted for breakfast or just devoured on its own. To start off I fed my starter at night to create the leaven. The next morning I mixed the final dough, mixing the leaven, water, and flour together and letting it autolyse for 30 minutes. After the autolyse period I mixed in the cherries and salt using the finger pinch technique (thank you Chad Robertson) and tossed it in the oven at 85 degrees for its bulk fermentation. Following the Tartine method, I turned the dough once every 30 minutes for the first two hours of bulk fermentation (4 turns) and then left it to sit undisturbed for one more hour. The dough looked ready, so I pre-shaped my boule and let it set for a 20 minute bench rest. One more shaping and off into the fridge it went for 18 hours. I baked it the next morning in my Lodge enamel/cast iron dutch oven. 20 minutes covered at 450 degrees and then 14 minutes uncovered with the oven on convection bake at 440 degrees. -Mix dough with leaven, adding in cherries and salt after 30 minute autolyse. -4 hours bulk fermentation at 85 degrees with 4 turns during the first 2 hours. -Pre-shape followed by a 20 minute bench rest, followed by the real shaping. -Proof in the fridge for 18 hours. Nice! I don't think I've ever baked with buckwheat flour. Thanks, Floyd. Pick up a bag and give it a try! Just don't substitute too heavily with it or you'll kill the oven rise. What a greaat looking loaf of bread! ....but that picture made my mouth water with how I IMAGINED it would smell and taste hot from the toaster. Wow! 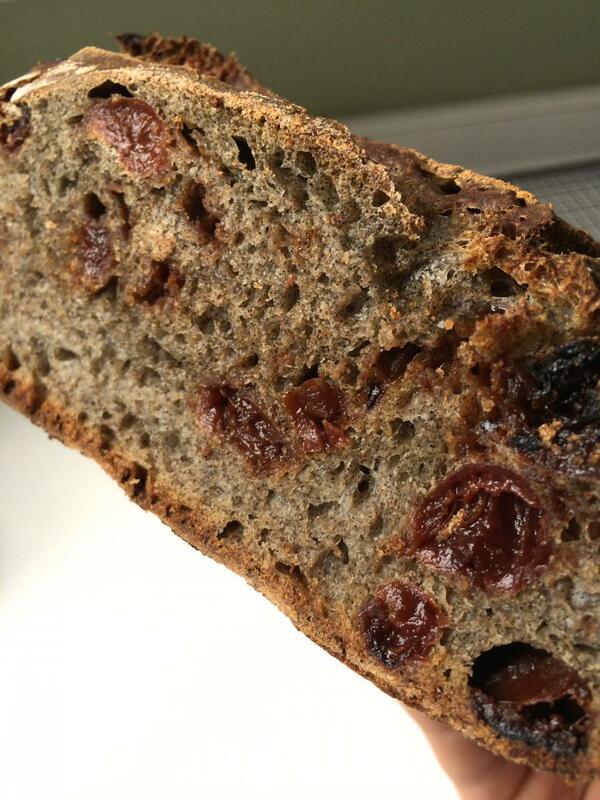 I've used buckwheat flour in my breads in varied amounts. I'd say it's an acquired taste. The flavour's earthy and nutty, and smells like a pile of damp, rotting leaves if fermented for some time. Sounds unappetizing, I know, but I adore it! This loaf was 2nd in line on the morning it was baked (a whole wheat sourdough loaf was in the oven before it), so it was probably sitting at room temp for about 1.5 hours before it was baked. I've had good results baking loaves straight out of the fridge as well though. What differences have you seen between the two methods? Looks delicious, I'm a sucker for all things cherries - have to give this a try (plus I've been wondering how buckwheat flour breads would taste like). What's the hydration of your starter? Thanks! Thanks, Kalikan. It's still one of my favorite bakes. I keep my starter at 100% hydration. Hope that helps! Thanks, Lazy Loafer. 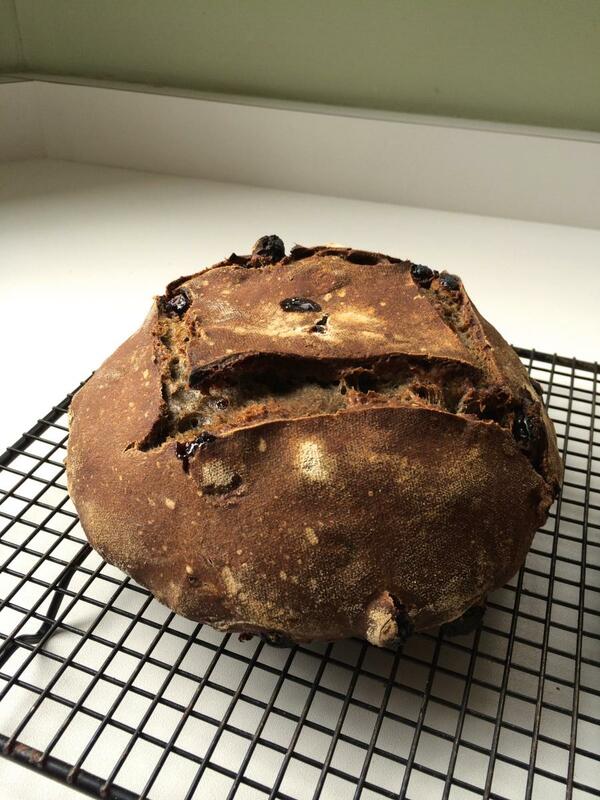 Your boule looks incredible-- how could anything not be great with cranberries?